The crunch: it's a phenomenon most developers are familiar with. But what happens when you are deep in the crunch without a team to back you up? How does that change things? How do you survive? Dean Dodrill, the creator of Dust: An Elysian Tail, was only one man—how did he manage with little to no support with an impending, completely terrifying deadline in his rearview mirror? The artist and programmer has spent four years creating his first game—Dust: An Elysian Tail—solo. Two of those years have been in a self-imposed crunch, working days that regularly stretched into 18 hours. He remained indoors for weeks at a time, glued to his desk, all the while working towards a crushing deadline. Such was Dodrill's predicament, he barely saw his new daughter in the first few weeks after she was born in the lead-up to the release of the game. You might say it's been worth it. Dust: An Elysian Tail was released as part of Microsoft's Summer of Arcade. It's sold enough for Dodrill to continue making games, and has received favourable reviews. But the success has come at a greater price. It's a consequence that speaks to the gargantuan task of actually sitting down and creating a game without having a support team behind you – a process that exaggerates the well-known horrors of "crunch" even after the game itself is packed and shipped. Having now released to the world a project on which he has painstakingly worked for years, Dodrill is sleep-deprived and restless. "The first few weeks after the release were still very hectic, and a lot of marketing. Non-stop emails and trying to keep up some resemblance of a community." "But it's also really depressing. This is my first project, and it's like sending your child off. The crunch was so difficult, and it's taken such a long time." "It's made me super depressed. I just couldn't look at the reviews, because it's such a personal and private thing out there. I didn't want to think about the game in the first few weeks, but I'm glad people have loved it." The story of Dust: An Elysian Tail is a long and, as far as games go, unusual. It started in 2008 when Dodrill wanted to investigate how to code. Having worked as an artist for several years – under Cliff Bleszinski, no less—he grew curious about the actual development process. So he set himself a task that he felt could be completed in just a few months. "I was discussing it with my wife when I first thought about it, saying I was going to spend three months doing this thing. It was where my career was headed, so she thought it was cool." The game quickly spiralled into a full-time affair, and a serious one at that. Dodrill spent more and more time refining the art and structure of the game, creating a story and a skeleton for a much larger and ambitious tale. 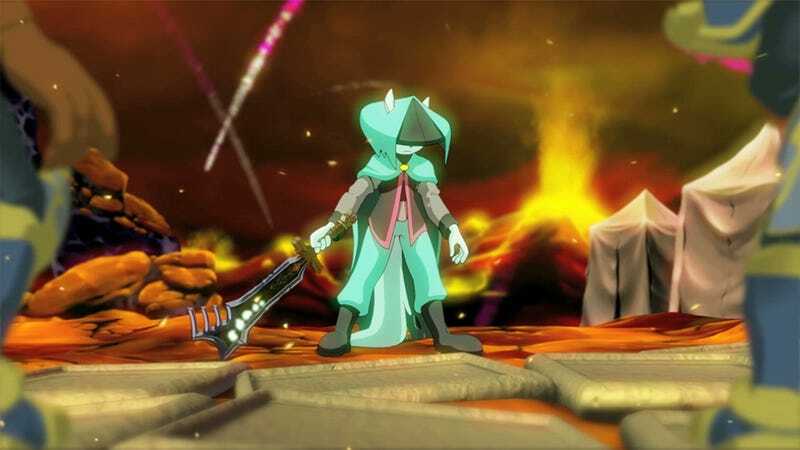 Dodrill was given some affirmation when he won a title at Microsoft's annual "Dream Build Play" competition, and was finally given a chance for mainstream success when he was invited to release Dust: An Elysian Tail as part of the company's Summer of Arcade. It just made the crunch worse. "When I first started talking to Microsoft about the Summer of Arcade, it was made pretty clear that this was not a deadline we could miss. And I wasn't going to break that. That was what made it so stressful, trying to make this game. I wanted this 10% of my life to be worth it, and I wanted to release a product I was happy with. "I could not miss this deadline." "But that made things harder, because I couldn't go to bed thinking I would just do something tomorrow, because tomorrow would bring new challenges. That's why I was just working non-stop." Dodrill's crunch was so brutal there were weeks when he didn't step outside, even to take a short walk. Everything was about the game—from dawn to dusk. "I would be in this weird other world," he says. There are thousands of developers who can attest to the problems with crunch time, when studios rocket towards the release of a game and all hands are on deck. But Dodrill's story shows even independent developers, able to set their own pace and schedule, are no strangers to this. They have their problems. Phil Fish spent years making Fez. But even he had a team—Jon Blow had programmers. Unlike them, Dodrill has done almost all of the bulk of the game himself—art and coding. Although he hired a writer, voice actors and musicians, Dust: An Elysian Tail is very much a one-man band. If he fell sick during development, there was absolutely no one that could pick up the slack. There's a benefit to working by yourself. Dust is the game Dean wanted to make – if it fails or succeeds, it will fail or succeed on his shoulders. There is no one else to blame, or to share the victory. "I just think of myself as a guy who loves videogames and who wanted to love them more by understanding how they were made." "The best way to do that was to make my own game. Now the game is out, and it's actually selling, I don't think myself as an "auteur". I'm just a guy who got lucky." But Dodrill says he wouldn't want that, anyway. Working with another person or even opening up a studio may not work for him—mostly because he's too stubborn. "I'd definitely say I'm pretty stubborn in my ways." That stubbornness comes out in what Dodrill calls his "pedestrian sensibilities". "I'm not so independent that I feel like, you know, ‘this is a message that I'm trying to tell, and you need to accept it'. I don't really design like that. I think I'm designing games to be enjoyed by the masses." "I really like telling stories, and emotional stories with a lot of resonance. But as for personal beliefs or a message, I'm not sure I have the subtle touch to do that through gaming as a medium. It can fall flat on itself when it's done wrong." "Dust is actually a fairly dark story, and from the outside it looks fairly kiddy and cutesy. But it actually has some quite dark dialogue in there, and I wanted to keep it that way." Dodrill's initial three-month experiment has been by any measure a success. But there's almost a bittersweet tone in his voice as he describes the aftermath of the game. He's been in the trenches for four years—getting back into the real world is a massive shock. And it's a shock still reverberating through his life in the weeks after release. "The project was really me learning to program. I knew nothing about it then, and I didn't know any code. But it's exploded and turned into this life-consuming project. It's kind of a self-imposed crunch, and it was brutal." "The last three or four months of production were really bad. I was crunching so much content and dialogue that it was kind of a nightmare. I hardly even saw my family, even though I work at home." Dust has been a success for Dodrill, his small team of associates, and his family. He's creatively and financially secure. But the product of such a huge endeavour on part of just one person almost serves as a type of warning for would-be imitators. The success of independent games has opened up the medium to new creative endeavours and experiments, and liberated many developers from the shackles of creation under a corporate empire – but you can never escape the pressures of self-imposed crunch. It's a lesson Dodrill may keep in mind during his next venture. "I've forgotten how to sleep." You can follow Patrick Stafford on Twitter, check out his website, or read more of his work at Problem With Story.